Section 24-1(a)(4) of the unlawful use of weapons (UUW) statute (720 ILCS 5/24-1(a)(4) (West 2016)) provides, in part, that it is unlawful for a person to possess or carry a stun gun or taser in a vehicle or in public. In two separate cases, the circuit court of Du Page County held this provision unconstitutional under the second amendment to the United States Constitution (U.S. Const., amend. II). The - 2 - State appealed both judgments directly to this court pursuant to Illinois Supreme Court Rule 603 (eff. Feb. 6, 2013), and we consolidated the cases for review. For the reasons that follow, we affirm the judgments of the circuit court. This is a fun ruling to read. Now that is awesome. Just finished reading the opinion of the court. Now I imagine we will see a change in the FCCA to include stun guns and tasers. Until then I would think we're good to go with no restrictions. Actually read the whole thing just now. And MollyB you are correct, it was a fun read, and at times I had a smile on my face! Was it not stated that it would be the same as concealing and carrying a rifle/shotgun? Im heading back and will update those who dont wish to read it all. Ill grab the exact location sos to help a bit. Subparagraph (iv) of section 24-1(a)(4) excludes from the offense of UUW only those weapons that are carried or possessed in accordance with the Carry Act by a person who has been issued a concealed carry license. To be in accordance with a statute means to be in agreement or conformance with that law. See Websters Third New International Dictionary 12 (1993). In our view, the most natural reading of the requirement that weapons be carried or possessed in accordance with the Carry Act is that the weapons, themselves, are of the type for which a valid concealed carry license may be issued under the Carry Act. Indeed, any other reading would lead to absurd results. Under the States reading of the statute, as long as a person has a concealed carry license for a handgun, that person may carry any other weapon, including a rifle or shotgun, and still be acting in accordance with the Carry Act, even though the Carry Act is specifically limited to handguns and does not allow for the concealed carry of rifles or shotguns. We do not think the States interpretation is what the legislature intended. Yeah Im back a third time: Reading and following the threads about carrying and or having a AR pistol on or about your person in a truck and discussing elsewhere would now be moot? Yes? No? Edited by Bubbacs, 21 March 2019 - 12:24 PM. A pistol is a pistol. Yes. I read what you did and all I can say is that the State's lawyers are a bunch of idiots. They were slapped down by the Supreme Court and rightly so. Now I want to by a Taser, carry it, just because I can. Does this mean you must have a CCL in order to carry a taser or stun gun? Or can non-CCL people carry one without a license?? Tasers and stun guns are specifically not included in the carry act. ""Licensee" means a person issued a license to carry a concealed handgun." But later, refers only to being allowed to carry a "firearm", not a "handgun"
his or her person; and ..."
This ruling may have worked against us to a degree on the broader interpretation of carrying a concealed firearm. Our conclusion that stun guns and tasers cannot be carried or possessed “in accordance” with the Carry Act because a concealed carry license cannot be issued for those weapons is further supported by section 24-2(a-5) of the UUW statute. This provision states that section 24-1(a)(4) of the UUW statute does not “apply to or affect any person carrying a concealed pistol, revolver, or handgun and the person has been issued a currently valid license under the Firearm Concealed Carry Act at the time of the commission of the offense.” 720 ILCS 5/24-2(a-5) (West 2016).3 When read together with section 24-1(a)(4), section 24-2(a-5) makes clear that only those weapons that can be licensed under the Carry Act are meant to be excluded from the reach of the UUW statute. Doesn't the above section basically mean that the Carry Conceal Act doesn't apply? So if the Act doesn't apply, it would appear that you would be able to carry those without a Carry License. As you can see, under the definition a concealed firearm is limited to a handgun, it does not include any type of a long gun. Wow, and Anne Burke delivered the judgement. Ed Burke's wife. They are not a bunch of idiots. They are doing their job extremely well, and they argued the case well. The fact that they lost is great for our cause. You do not want to win a case with idiot attorneys on the other side. You want to blow them away when they are talented, and this is what happened! The victory is much sweeter when the vanquished had their own honor, congrats on a good job, but bye bye. This case should be used as another ruling to support the FOID card is unconstitutional lawsuit. A good case to be used to attack the unconstitutionaly of the inevitable scary looking gun bans and firearms licensing in this state, lower courts are really going to have to squirm to justify bans on any arms in common use after this ruling. You are correct. 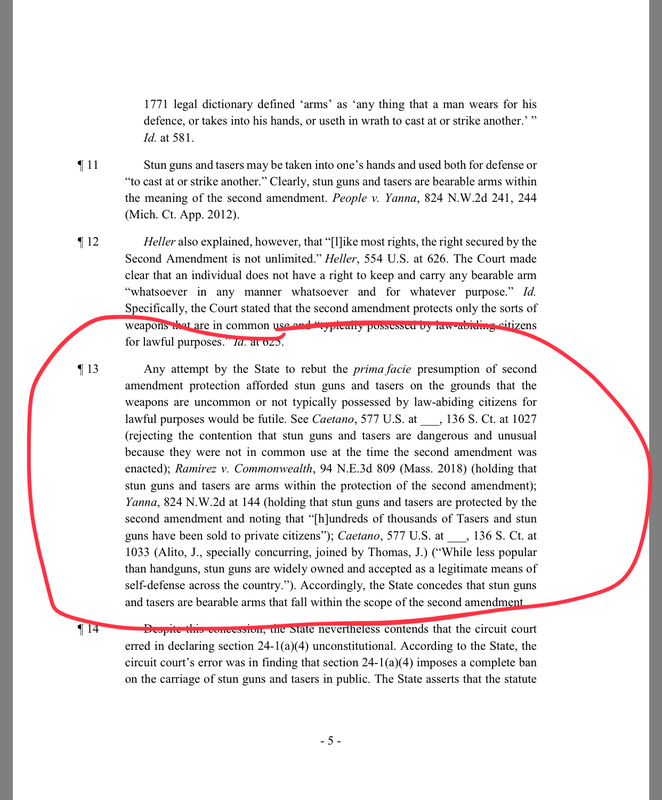 Justice Kavanaugh pointed this out in a dissent arguing semi auto rifles are protected. "Most handguns are semi-automatic," Kavanaugh said. âAnd the question came before us of semi-automatic rifles and the question was, "Can you distinguish as a matter of precedent?" Again, this is all about precedent for me, trying to read exactly what the Supreme Court said and if you read the McDonald case. And I concluded that it could not be distinguished as a matter of law, semi-automatic rifles from semi-automatic handguns. And semi-automatic rifles are widely possessed in the United States. There are millions and millions and millions of semi-automatic rifles that are possessed. So that seemed to fit common use and not being a dangerous and unusual weapon." Edited by NakPPI, 22 March 2019 - 08:46 AM. All a good lawyer would have to do, if a ban is signed into law, is refer to People Vs Webb where it states what I circled, as ARs/semi-autos are far more common then stun guns, which stated here they said are less used than handguns, but still in common use, so therefor how could they ban semi autos/magazines which are in common use more than the commonly used stun guns? Edited by steveTA84, 22 March 2019 - 09:06 AM. The thing I don’t like about using this argument is being painted into a corner. What using that terminology does is says we are NOT fighting for things like full auto because they aren’t in common use. While it does seem to make keeping semi auto firearms safe, it also seems self defeating in the argument to lift the full auto production ban or the NFA. What this does (ILSC case) is give a solid ground to fight any type of ban on firearms/magazines/etc as they are in common use and available at any gun shop and online. How can they have a ban on magazines, or an AR for that matter, when they’re everywhere? I would argue that full auto is in common use all over the world and in the US by those 'allowed' the fact that there is a pre-existing and infringing law that forbids many from using them doesn't equate to them not being in common use. The thing I dont like about using this argument is being painted into a corner. What using that terminology does is says we are NOT fighting for things like full auto because they arent in common use. While it does seem to make keeping semi auto firearms safe, it also seems self defeating in the argument to lift the full auto production ban or the NFA. I am 100% in agreement with your position. The Narrative is two fold. First is in common use second is relation to the preservation or efficiency of a well regulated militia. We the people have the right to defend against a tyrannical government with like defenses. As a well regulated militia we would have the right to all firearms. The NFA created an artificial gap in what IS in common use as far as the public is concerned, and what SHOULD BE in common use. I have no doubt that if the unconstitutional NFA hadnt been put in place, most people who currently own modern sporting rifles, would undoubtedly also own many full auto firearms, with little to no effect on the currently touted statistics of deaths by firearms. Edited by Twostarrz, 22 March 2019 - 11:31 AM.